GEICO Nationals field gets late addition as state championships wrap up around the nation. One week of basketball remains before GEICO Nationals takes center stage April 4-6. The field was announced last week, with some unprecedented circumstances surrounding one of the teams in the event. 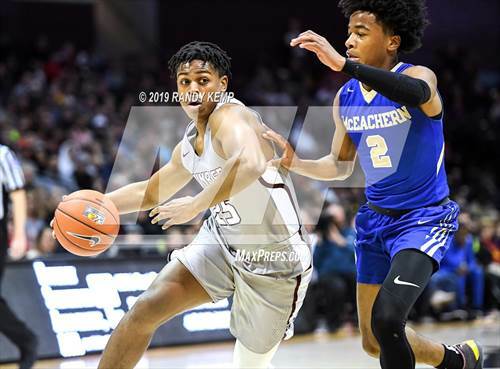 Due to disagreements within the program, top-ranked McEachern (Powder Springs, Ga.) dropped out of the field, putting a damper on an event that was set to feature each of the top four teams in the country. Bishop Gorman (Las Vegas) will replace the Indians. After the dust settled, the eight-team field will feature first round match-ups of one-seed La Lumiere (La Porte, Ind.) vs. eight-seed Bishop Gorman, No. 2 Montverde Academy (Montverde, Fla.) vs. No. 7 University (Fort Lauderdale, Fla.), No. 3 IMG Academy (Bradenton, Fla.) vs. No. 6 Sunrise Christian Academy (Bel Aire, Kan.) and fourth-seeded Oak Hill Academy (Mouth of Wilson, Va.) vs. No. 5 Wasatch Academy (Mt. Pleasant, Utah). Top 25 squads No. 7 Ranney (Tinton Falls, N.J.), No. 8 Nicolet (Glendale, Wis.), No. 13 South Central (Winterville, N.C.), No. 16 Belleville West (Belleville, Ill.) and No. 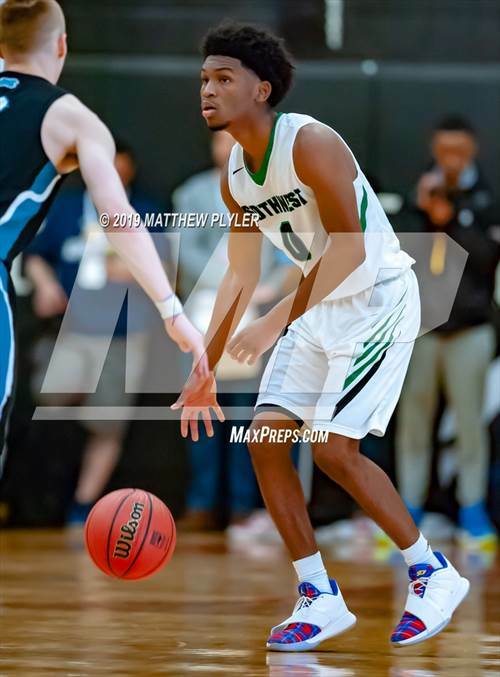 17 Southwest Guilford (High Point, N.C.) all wrapped up state title runs, while previous No. 7 Curie (Chicago) and previous No. 23 Roman Catholic (Philadelphia) drop out after state tournament defeats. Only a few states across the nation are wrapping up postseason play, as Top 25 teams No. 14 Archbishop Moeller (Cincinnati), No. 20 Carmel (Ind. ), No. 22 Long Island Lutheran (Brookville, N.Y.) and Next 5 Imhotep Charter (Philadelphia) vie for state titles this week. Completed a run to the program's first state title with a 62-54 victory over the defending state champion Meadowcreek (Norcross). After accepting an invitation to GEICO Nationals, the Indians backed out later in the week due to turmoil behind the scenes that led to Sharife Cooper and others announcing they would not participate in the national championship event. Season complete. After wrapping up the school's first unbeaten regular season, the Lakers were rewarded with the top seed in GEICO Nationals. They face No. 17 Bishop Gorman in the April 4 first-round matchup. Enter GEICO Nationals looking to repeat as champions after winning their record fourth event title last season. Montverde opens play with a rematch of last year's GEICO Nationals title game, taking on No. 13 University in the first round. Will look to capture their first win at GEICO Nationals after a 2016-17 first-round upset by seven-seed Greensboro Day. Led by a trio of McDonald's All-Americans, this group has all the talent needed to capture their first GEICO Nationals crown. The Ascenders draw No. 10 Sunrise Christian Academy in the first round. Finished up back-to-back CIF Open Division state championship runs with a convincing 76-52 state title game victory over Sheldon (Sacramento). The Trailblazers have been impressive all season long, with their only in-state loss coming to Rancho Christian (Temecula) in their regular season finale. Won third consecutive AHSAA Class 7A state title after an impressive regular season that featured quality out-of-state wins over No. 4 IMG Academy, Bearden (Knoxville, Tenn.), Meadowcreek (Norcross, Ga.), Memphis East (Memphis, Tenn.), Olive Branch (Miss. ), St. Pius X Catholic (Atlanta) and Wilson (Washington, D.C.) among others. Season complete. Battled back from multiple double-digit deficits to capture first New Jersey Tournament of Champions title. 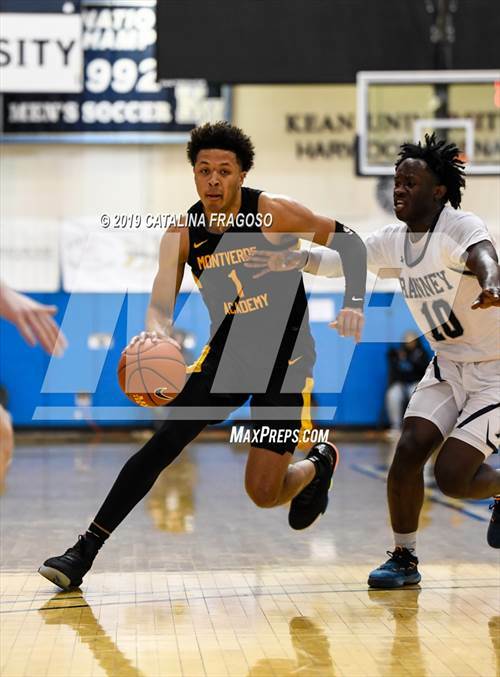 The Panthers knocked off Bergen Catholic (Oradell) 67-63 in a classic. 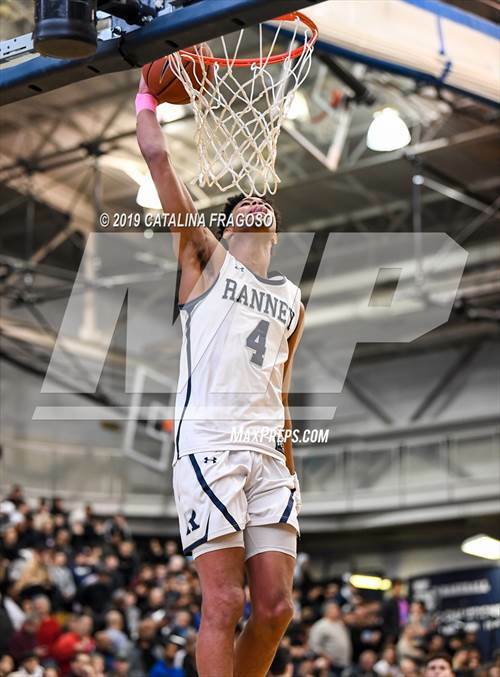 Ranney has notched signature victories over No. 13 South Central, Federal Way (Wash.), Roselle Catholic (Roselle) (twice), Gill St. Bernard's (Gladstone) and Wildwood Catholic (Wildwood) along with their pair of wins over Bergen Catholic. Season complete. Finished an incredible year with a dominant 67-52 victory over Washington (Milwaukee) to capture the WIAA Division 2 state championship. The Knights finish the year 25-0 vs. in-state opponents, their lone loss coming Dec. 9 in their fifth game of the season against Paul VI (Fairfax, Va.). Season complete. Received an invitation to their third GEICO Nationals in the last four seasons after an impressive regular season run that includes wins over No. 10 Sunrise Christian, Legacy Early College (Greenville, S.C.) and Meadowcreek. The Tigers will look for their first win at the event, with a favorable first-round matchup against No. 16 Oak Hill Academy. Received their first invitation to GEICO Nationals where they will take on No. 3 IMG Academy in the first round. Although the Buffaloes have five losses on the season, wins over No. 12 University, No. 23 Duncanville, Guyer (Denton, Texas) and Imhotep Charter (Philadelphia) bolster a strong resume. After a tough stretch that saw them lose two of three, the Stags finished the season strong — winning the Maryland Private School state title and Alhambra Catholic Invitational tournament. DeMatha also captured the Washington Catholic Athletic Conference regular season title, finishing 18-2 in WCAC play. Season complete. Won back-to-back FHSAA Class 5A state titles with a dominant title game win over Andrew Jackson (Jacksonville) 72-46. The Sharks return to GEICO Nationals with a stiff first round test, taking on the defending event champion, No. 2 Montverde Academy in a rematch of last year's championship game. The Falcons captured their first state title in impressive fashion, setting the record for the largest margin of victory in the history of the NCHSAA Class 4A state championship game — knocking off West Charlotte (Charlotte) 72-46. South Central finished 30-0 against North Carolina opponents, with their lone loss coming against No. 7 Ranney in the John Wall Invitational championship game. Season complete. Defending OHSAA Division I state champions extended winning streak to 47 games last week with a 59-41 win over Centerville in the regional finals. The Fighting Crusaders take on St. Edward (Lakewood) on Friday, with a trip to Saturday's state championship game on the line. Jovan Blacksher and Jaelen House combined to go 105-26 with four state championships over their four-year career at Shadow Mountain. The Matadors were not invited to GEICO Nationals this year after receiving an invitation to the Big Apple in each of the past two seasons. Season complete. Capped back-to-back IHSA Class 4A state title runs with a dominant 70-48 semifinal win over previous No. 7 Curie (Chicago), before battling back to take down Evanston 71-59 in the championship game. The Maroons possess quality out-of-state wins over Rayville (La. ), Callaway (Miss. ), Madisonville-North Hopkins (Madisonville, Ky.), Rainier Beach (Seattle), Springfield Catholic (Springfield, Mo.) and Vashon (St. Louis) among others. Season complete. After hitting the 30-win mark for the eighth consecutive season, the Warriors return to the Big Apple for their 10th appearance in GEICO Nationals, tying the record for most appearances. Oak Hill opens with a tough first-round matchup, taking on No. 9 Wasatch Academy on April 4. Completed the run to an eighth consecutive Nevada state championship, defeating Clark (Las Vegas) 68-60. Despite not initially receiving an invite to GEICO Nationals, the Gaels replace McEachern after the top-ranked Indians dropped out last week. Bishop Gorman draws top-seeded La Lumiere in the opener. Dominated its IHSAA Class 4A state semifinal showdown with Penn (Mishawaka), picking up an easy 71-42 victory to advance back to the title game for the second consecutive season. The Greyhounds look to complete their quest for redemption Saturday, taking on Ben Davis (Indianapolis) in the IHSAA Class 4A state title contest. Captured back-to-back WIAA 4A state championships, knocking off previously ranked Federal Way 61-53 in the semifinals, the Bullpups' biggest win of the season. 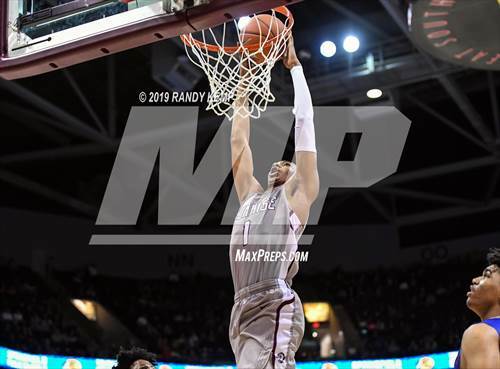 Gonzaga was led by Gonzaga commit Anton Watson, who was recently named Seattle Times Player of the Year and Mr. Basketball in the Evergreen State. 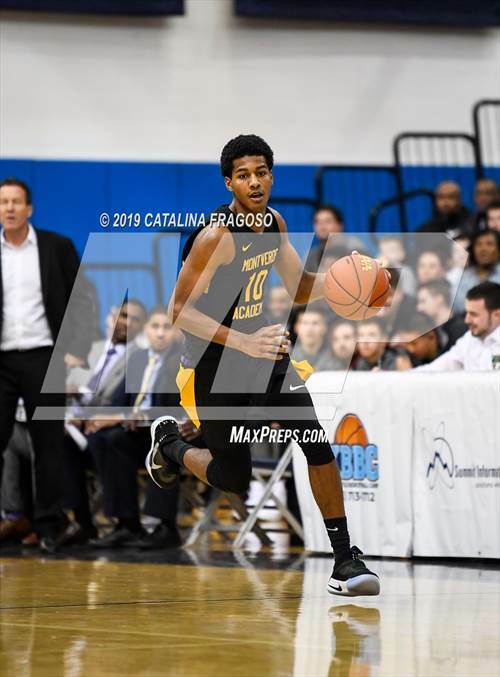 After a disappointing finish to last season, the Crusaders hope to capture the New York state federation Tournament of Champions entering postseason play as favorites to capture their first title since 2012. 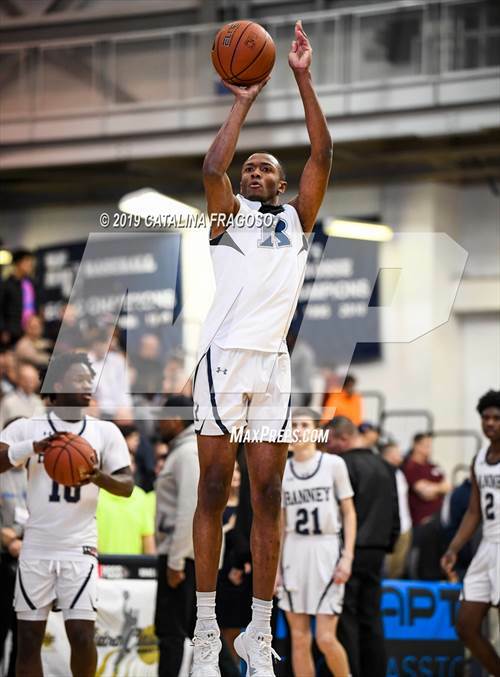 The Crusaders draw South Shore (Brooklyn) in their first-round showdown on Friday with an opportunity to advance to the championship game the following day. Finished the season on a 25-game winning streak, overcoming massive in-state challenges against DeSoto, Trinity (Euless), Guyer (Denton), North Shore (Houston) and Klein Forest (Houston) in the final five games of their UIL Class 6A state title run. Season complete. 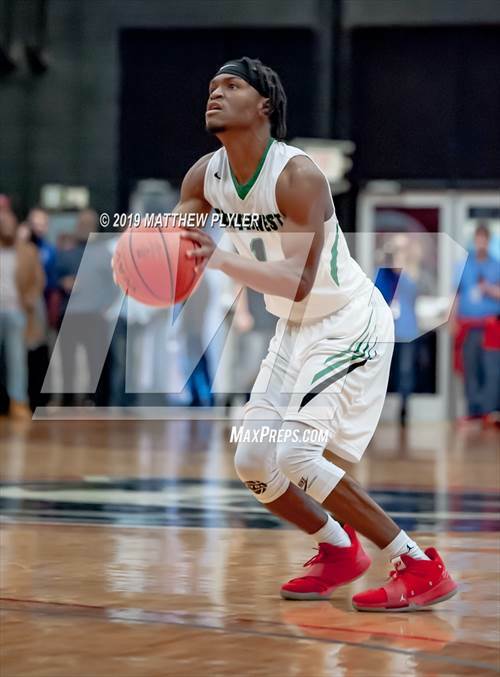 Notched quality wins over Bartlett, Bearden (Knoxville), Huntington St. Joseph Prep (Huntington, W.Va.), Legacy Early College (Greenville, S.C.) and Memphis East this season. Season complete. Jump back into the national rankings for the first time since December after two teams fall out of the Top 25 ahead of them. The Wolves ended the year on a 19 game-winning streak, capturing their second UIL Class 5A state title in the last three years after avenging an earlier loss to Wagner (San Antonio) 77-64 in the state title game. 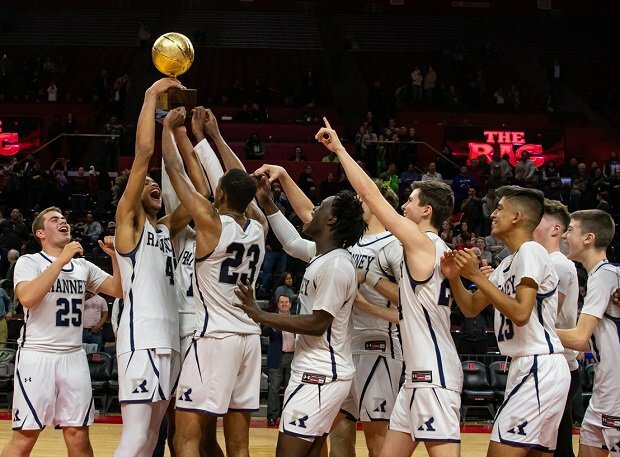 Ranney players hoist the trophy after winning the New Jersey Tournament of Champions.